[ARCHIVED THREAD] - Anyone using a BCM vertical grip on their pistol? Thinking of adding one of these to my pistol but was hoping for some feedback first. First of all, even though it says vertical, there is an angle to it so it should be GTG on a pistol (non SBR) correct? If memory serves me correctly, the ATF has defined vertical as 90 degrees to the bore of the barrel. Input here is appreciated. Secondly, do you like running it with the angle forward or backwards? Any perceived advantage or just user preference? Lastly, do you feel it's secure with just the one cross bolt? I don't have a key mod rail. Well...let's just say that unless your pistol is longer (OAL of 26"...and even that is very specific), you cannot put a front vert grip on one. I will say, I have the keymod version of that grip...and it's awesome. I would guess it would be sweet on my AR pistol (not 26")...but I will never do that. I really don't think you want to be the test case if you were ever "caught" with that. I will add to that as I use one. I like it angled back. It doesn't use a cross bolt, but a clamping force to keep it in place. It's very secure and I haven't seen a bit of deflection/shift. People always think they can outsmart the ATFE over minutia. Go ahead, test them, see what happens. Do you really think you are the first to come up with this, or other, perceived 'loop holes' and that the ATFE has not considered these? People think they are so sly and try to convince themselves if they put the grip on the side, so it is horizontal instead of vertical, they have outsmarted the ATFE, or in this case, if the grip is not 100% 90* and vertical to the axis of the bore. Generally, when caught, there is a word used to describe these people you might want to get familiar with: FELON. The Magpul AVG cannot be griped, not in any normal since of the word. Other angled things like the AVG are not designed to be gripped, just hand stops or rests at best. If it is designed to be a grip, its an VG and unless your OAL is 26 inches or longer, or you have it on a SBR, your best advice is get over it and move along. No, a Harris or most other bipods is not a VG, a Grip-pod is. But, IF you really think you are smarter than the ATFE, have more resources to avoid prosecution, and can piss in their sandbox and get away with it, please, by all means be a test case (OK, I concede, it's OUR sandbox but it seems they somehow got the power to make the rules on how we play). Please keep a journal of proceedings and maybe you can get a movie deal out of it while you are in club fed, unless of course, the government seizes your profits since you cannot profit of a criminal act, if that applies in a case like this. And if it does, maybe you can find a loop hole in that law and see if it works out any better. I do have this installed on my pistol, and it works great. No need to poke the skunk here...and plenty of ways to play well within the the limits of horribly stupid and unconstitutional rules we currently live under. Why does a simple question requesting some feedback ellicit such responses? We're all in this for the same reason. Why the hate? The way I read this letter is that there is no true definition of "vertical" and their opinion is that it means 90 degrees (not 85, 105, or 88) to the bore of the barrel. If the grip has any any angle to it, it wouldn't meet the definition right? If you don't agree, please defend that position. Yes this is for a specific individuals question but why would you expect that to change? Does anyone want to write another letter to the ATF? Hell no! They mention it very clearly there. "Federal law does not define vertical fore grip. ATF has determined..."
ATF can change their determination at any time for any reason. See the Sig Brace. This. Not worth the legal hassle if there's an issue. A LEO isn't going to measure the angle of your grip. You'll get fined/arrested/whatever and after paying your lawyer and missing work for court you might prove they didn't specifically mention vertical grips that are angled and get off. Or you might get prosecuted. ETA: just realized the name of that product is vertical grip. So if a LEO tries to give you the benefit of the doubt and does a google search to learn about the grip on question, literally the first thing they'll read is "vertical grip"
But in regards to the initial brace letter, the ATF never changed the law and made a determination for one individual yet how many 1000's of pistols/braces were sold because of it? Now they did back track on that initial opinion but no law has been made to address it that I've heard about. Hence we come to the misnamed "vertical grip". If it's not 90 degrees by definition of Webster, etc. as well as ATF, it's not vertical. Why haven't 1000's of people put these on their pistols - legally? I'd say as long as the description of the part you want to add says "vertical grip" it's probably going to be considered a vertical grip. Because no one wants to be the test case if they get popped for it? I understand it's a stupid law. It's not a "law", but an ATF interpretation of definitions found in the USC. And btw, no one has ever been convicted for having an illegal NFA firearm due to having a VFG on a handgun. Note the sentence I highlighted. They emphasized around. "a short stock designed to be gripped by one hand and at an angle to and extending below the line of the bore(s)"
The "gripped by one hand at an angle to and extending below the line of the bore" is covered by the firing hand pistol grip, so the addition of any second grip that is also gripped at an angle to and extending below the line of the bore is no good. This would include the BCM VFG. Products like the Magpul AFG have been allowed by the ATF, and my thinking is that when you use those products, you can still wrap your support hand "around" the barrel (bore), as with the C-clamp grip, and not entirely "extending below the line" of the barrel as you would with a VFG, and that is why they have been given the okay. But the forward grip on a Thompson sub gun, counts as a vertical forgrip and it's not vertical either, so I guess you can be the test case, but if your wrong at least you won't have to worry about your guns anymore. So isn't everyone being hypocritical in this case about the grip if we (the gun industry and consumers) went all out for over a year selling/buying 1000's of ar pistols with braces based on one opinion letter to a single individual that said the sig brace could be shouldered? No one got all worried about that. Same thing happened here and the ATF even admitted that there is no definition of what constitutes a vertical grip. So, as with the Sig brace letter, they took a stance on the question asked and said a vertical grip is 90 degrees to the bore of the barrel and forward of the magwell. If there was something in the law that was pertinent to the question, wouldn't they have quoted it like they do in many other letters? Also I don't understand the focus about where it's located on the barrel. That's not at issue here. It can be 90 degrees to the bore of the barrel in a 360 circle around the barrel so it can be illegal anywhere you want to mount it. So isn't everyone being hypocritical in this case about the grip if we (the gun industry and consumers) went all out for over a year selling/buying 1000's of ar pistols with sig braces based on one opinion letter to a single individual? Same thing happened here and the ATF even admitted that there is no definition of what constitutes a vertical grip. So, as with the Sig brace letter, they took a stance and said its 90 degrees to the bore of the barrel and forward of the magwell. Write them for an opinion letter and prove us all wrong. Are you shitting me? People were losing their minds over that whole episode. There were probably 10 Sig brace threads on the "active topics" list at any given time. You could find them for half price or less in the EE and there were tons of people getting out of them all together. People were pulling pictures and videos of themselves shooting with a sig brace shouldered. It was pretty comical, really. You're missing the point - the AFG is allowed because you are gripping around the bore - not a grip that extends below the bore axis. This is just your conjecture. Fact is the AFG could be allowed because as this, and another letter I've seen, says it's not 90* perpendicular to the bore. All the ATF letters about these angled type grips simply state that the ATF does not consider them a vertical fore grip. It doesn't state why anywhere except in this letter. I'm not advocating using any grip or not. Simply pointing out the facts. Everyone did indeed go batshit crazy when an ATF letter sent to that sheriff stating the ATF did not regulate the misuse of a product. 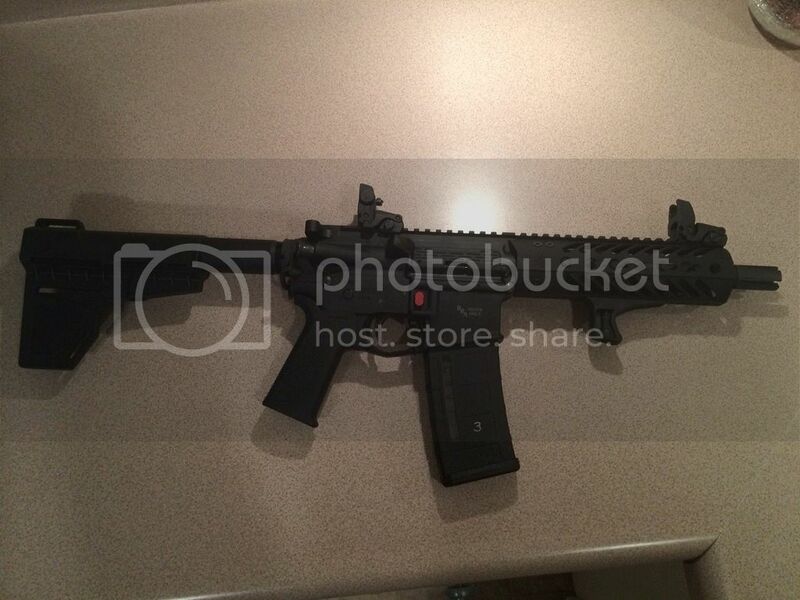 This was considered "proof" to everyone that a brace was gtg for use as a stock on a pistol. Yet here is a letter that clearly states the ATF position on the what they consider to be a VFG and everyone is guessing it doesn't mean what it very clearly, in plain english, states. What a fickle bunch we have here. When you start seeing people brought up on 922 (r), using the sig brace as a stock, sbr engravings, you can pretty much file this with dog licenses.